Not All Carton Flow Rack is Created Equal… And That’s on Purpose! 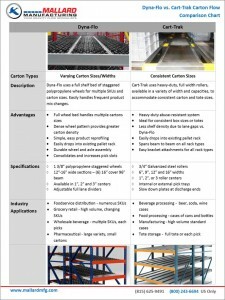 When shopping for the right carton flow rack there are several things to consider. We first ask our customers if they are handling consistent carton widths or varying carton widths … and we go from there. Since a picture is worth a thousand words, let’s use these short video clips to help show the major differences of the Mallard carton flow rack line options. So what did we just see? Well, for starters, yes, both systems are of course gravity-fed, carton flow systems and both are built to last in busy warehouse environments, but the differences are key for saving time and increasing picking/replenishing accuracy and speed. Dyna-Flo carton flow uses a full shelf bed of staggered polypropylene wheels for applications with multiple SKUs and carton sizes. 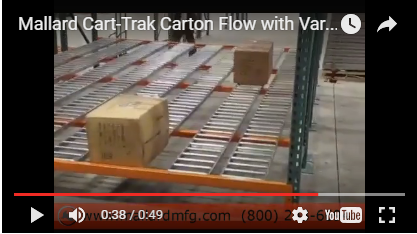 Cart-Trak carton flow uses heavy-duty, full width rollers to accommodate consistent carton and tote sizes. Both carton flow products easily drop into existing roll-formed or structural pallet rack and can be fitted with entry guides and full-length lane dividers for greater SKU differentiation. If you’re interested in learning more about the Mallard carton flow rack options available and how to best put them to work for you, check out our comparison chart. 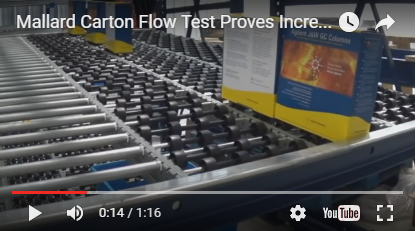 And remember, our testing lab is a great place to give carton flow a try before you buy! We look forward to working with you on your next gravity flow project.